The MacBook Pro isn’t the only thing getting updated today, Apple is also updating the Smart Cover for iPad 2 devices. Of course its not as awesome as a hardware upgrade, but let’s see what they are updating. First off, they are removing the bright orange polyurethane color from their line up and replacing it with a dark gray Smart Cover. The new dark gray looks very simple and probably reaches more masses in terms of projected "sellability". Other colors for the polyurethane include a light gray version, pink, blue, and green. We are hearing that the new covers are more vibrant in their color depth. The polyurethane Smart Covers also get a color match treatment on the underside; facing the screen itself. What that means is both sides of the cover will be the same unlike the previous one, where it was gray in color. The leather version seems to go untouched on all colors except for the Navy Smart Cover, it got a slight color enhancement. This is one of the things which I have always appreciated about Apple, they create a product and offer a a great case solution that is functional, minimal, and stylish all at the same time, and also adds that ‘wow’ factor along with added functionality. Then to "update" these products means that Apple cares about the details and small products just as much as it cares about the electronic devices that it produces. I know its just a case, or really a cover, but its what Apple stands for that floss throughout all of their products. I have had my iPad 2 for a little over a week now and although I wanted something that offered a bit more device coverage, I really enjoyed the Smart Cover that I tried out at Best Buy Mobile. The simplicity of the magnet attachment and how useful it was amazed me. Just think about it, have you ever seen a cover like the one which Apple has to offer for any other device? Something which is so simple, and at the same time adds extra functionality to your iPad 2 itself, I bet you haven’t! I am looking forward to seeing the color updates on the new Smart Cover and maybe I will pick one up once they become available locally. 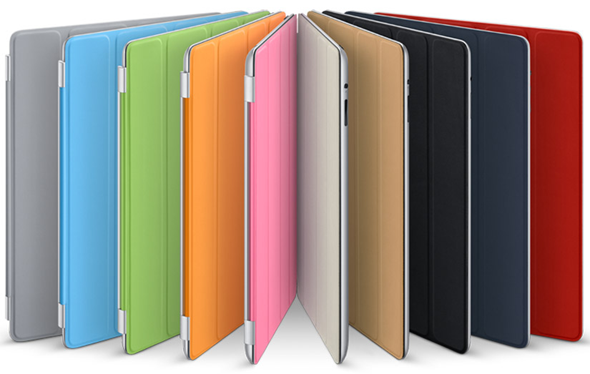 If you’re an online junkie, you can head over to this link and grab yourself a Smart Cover for your iPad 2.